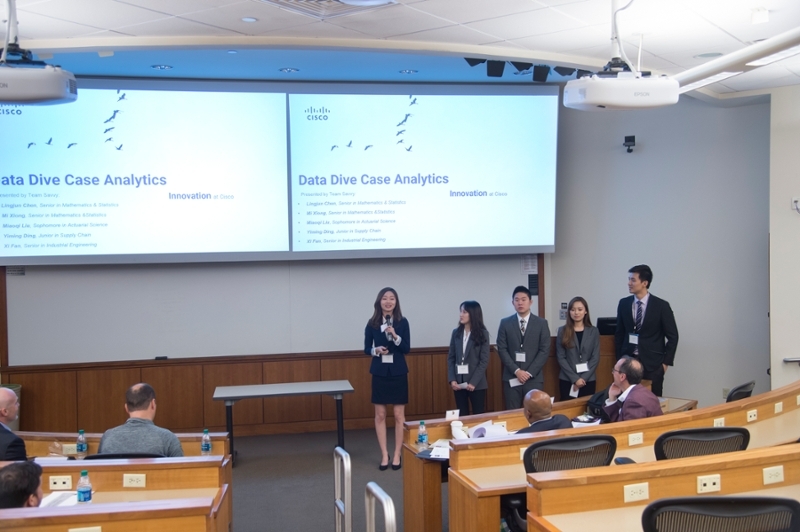 Cisco got a new view of some of the company’s recurring revenue streams and ideas for optimizing its return thanks to teams of Purdue students who competed in analyzing a large data set from the company. Winning teams of students in Purdue’s third “data dive,” held at the end of April, made out, too. They cashed in on $6,000 in prizes. 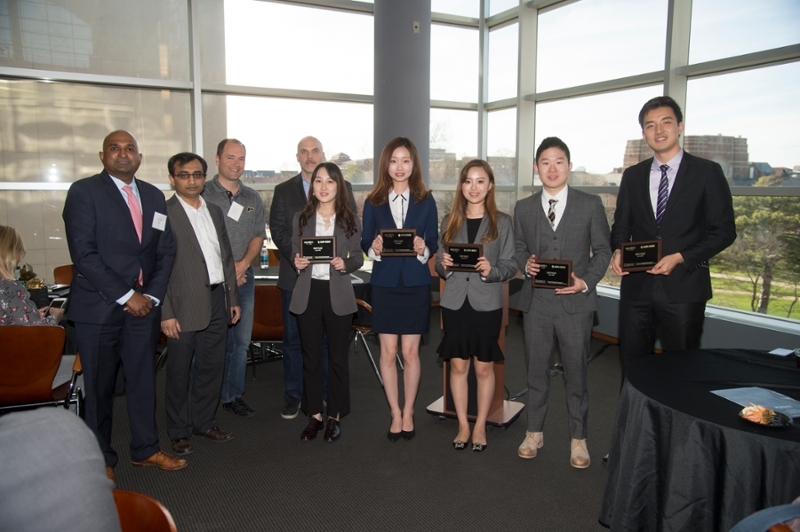 The Krannert School of Management's Business Information and Analytics Center, along with ITaP and Cisco, hosted the competition in partnership with Purdue’s annual Dawn or Doom conference on the risks and rewards of emerging technology. Each team had at least one Krannert student and one non-Krannert student with a total of three to five students per team. Thirty-six finalists on eight teams presented to the panel of judges. The presenters represented four colleges and 10 majors, such as finance, computer science and industrial management. Most were upper-level undergraduates, but a team of graduate students participated as well. Gerry McCartney, Purdue’s executive vice president for information technology and chief information officer, says the interdisciplinary nature of the teams reflects the demand for such diversity in today’s real-world business environments. The student teams used data from Cisco on renewals of service contracts for Cisco products. The company wanted to know how to increase service renewals and which products were more likely to result in service renewals and why. This is the second data dive competition for which Cisco has provided the data pool. Last year, the company walked away with a selection of business solutions related to its supply chain. In 2016, Wal-Mart partnered with Krannert in holding an inter-university data dive. The winning team, the Savvy, received $3,000. The mix of seniors, a junior and a sophomore varied in majors from industrial engineering and applied statistics to supply chain management, as required by the competition. Lingjun Chen, the team’s leader and a previous data dive participant, says the data, and all of its 237 variables, forced the team to do its homework. Chen is a senior in mathematics and statistics. He credits a class he took this semester, Data-Driven Decisions in Digital Business, for the success. His teammate Xi Fan, also a past participant and a senior in industrial engineering, says having the experience of the first competition helped them edge ahead of the other teams. “We learned how to use the data in a way that resulted in actual solutions; that data is money to the company,” Fan says. The rest of the Savvy includes Miaoqi Liu, a sophomore in actuarial science; Mi Xiong, a senior in applied statistics; and Yiming Ding, a junior in supply chain management. The second-place team, Marc Consulting Group, included Andrew Lentz, Charles Sloan, James Salafatinos, Matthew Gula and Riley Crane. They won $2,000. The third-place team of graduate students, the Flyers, included Haarthi Rajendran, Newmenji Jose Patris, Raghav Tamhankar, Varun Sukumar and Xiaoqing Ye. They won $1,000. Professor Mohammad Rahman, an associate professor at Krannert and the lead organizer of the data dive, says the competitions show him that the students are learning valuable lessons in the classroom.